Once upon a time, when I was just getting my copywriting start, I wrote what I thought was brilliant copy. I sweated and slaved and stressed over every word. In my mind, it was perfect. I went home feeling defeated, depressed and demoralized. After all, this was my first real client. I was writing for a famous author (whom I won’t name, but I soooo want to.) Sure, I expected feedback…but not that. The only reason I didn’t quit copywriting is because I got mad. REALLY mad. Instead of internalizing it or calling out the client, I used it as fuel. I vowed to transform myself into such a good writer, I’d never get that kind of feedback again. Fast-forward 10ish years. The recession is in full swing. I went from riding high to losing 90 percent of my clients within a week. My contacts were laid off. The budgets were gone. And yes, I felt like a major failure…but I learned what I could from it. “Failure” is important data, wrapped up in a painful package. Sometimes, stuff doesn’t work out. The page we were SURE was a conversion monster falls flat. We’re thisclose to landing a hot client, but they go with someone else. We spend time and money getting a page to top-10, only to find that it doesn’t help with conversions or site views. We recommend a course of action that ends up to be wrong, despite everything we put into it. We make a lot of money…and then, the income dries up. And it hurts. Our ego is bruised. We lie awake wondering what went wrong. 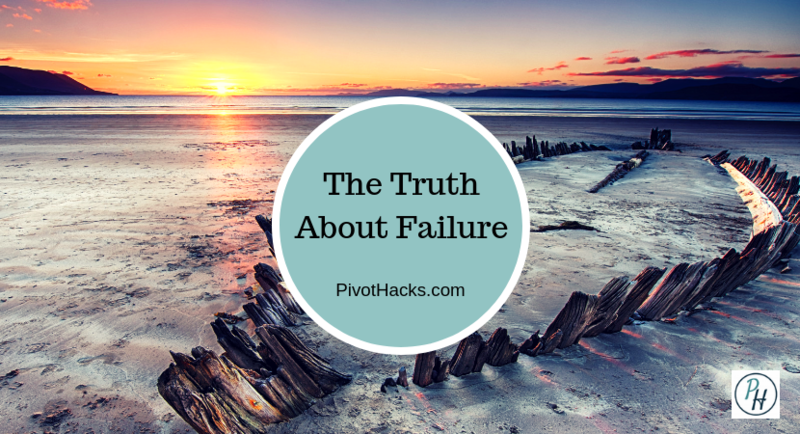 What if the word “failure” didn’t have such a stigma? Instead of feeling like crap, what if we focused on what we could learn so we could do it better the next time? We can run an A/B test and figure out exactly what the new landing page should look and sound like. We can evaluate what (if anything) went wrong during our sales process and see if we want to do things differently. We can reverse-engineer our thinking to figure out why our recommended course of action didn’t give us the results we wanted. We can use the lack of income “quiet time” to tweak our marketing — or to pivot our business — or to build a money-making product — or to get our heads on straight and refocus. We can use our failures as jet-fuel. I’ve done it. Multiple times. Maybe you have, too. Talking to other people who “get it” and can share their stories– for instance, other business owners/leaders — is highly therapeutic. Low-money months, cranky clients, “what am I doing?” moments, and failed campaigns are normal. People just like you go through this all the time. Often, just knowing that fact is enough to get things back on track. But sometimes, things refuse to click. For instance, you may have thoughts like, “Well, since that didn’t work, I’m afraid to try again.” You make your decisions based on fear. Or, you may have no idea what to do next. The current situation has you stuck, no matter how many hours you try to figure it out. Or, things aren’t changing, no matter what you try. And, you’re running out of ideas. Or, you know you need to do something different, but you’re afraid what others will think. That’s when working with a professional (like a business coach) can help you untangle those issues and make important decisions from a clear place. Plus, there’s something freeing about dumping, “Hey, I messed up here,” on the table and feeling amazing after an hour’s chat. Bottom line, what’s the takeaway? Nobody is #crushingit forever. Professional failures are normal. And, if you’re feeling stuck — or just need a different perspective — there is a lot of help out there. And if you dig this information, StartUp’s Alex Blumberg is launching a podcast discussing professional failures starting October 1st. Here’s some more information. Are you learning and thriving and growing from it? Or, do you still feel stuck and “in your head?” Hit “reply” and let me know.